The Curtiss XA-14 was a 1930s United States airplane, the first multi-engine attack aircraft tested by the United States Army Air Corps. Carrying a crew of two, it was as fast as the standard pursuit aircraft in service at the time. Originally built as an in-house venture as the Curtiss Model 76, powered by two experimental Wright XR-1510 radial engines, flight testing was sufficiently impressive that after the USAAC appraisal the Model 76 was returned to Curtiss and fitted with two 775 hp (578 kW) Wright R-1670-5 Cyclone engines with constant-speed propellers. This configuration was accepted by the Army with the designation XA-14. It had standard Army markings with the serial number 36-146. The Model 76 was of all-metal construction with an oval section semimonocoque fuselage, described as "pencil slim". The XA-14 was extensively tested, at one stage being fitted with a 37 mm (1.46 in) nose cannon. 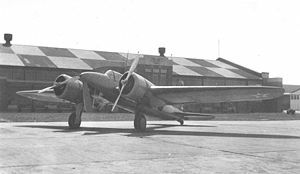 In July 1936 thirteen (serial numbers 37-52 to 37-64) developed versions, re-engined with two Wright R-1820-47 Cyclone twin-row radials, were ordered into production as the Y1A-18.